TGIF and hiya guys! 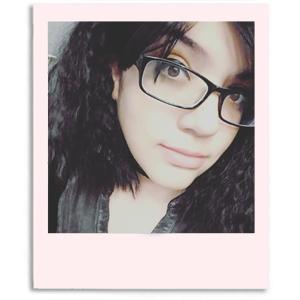 Or should I say hi Whovians?! Yes, that's right rejoice and get ready for some Doctor Who inspired polishes. 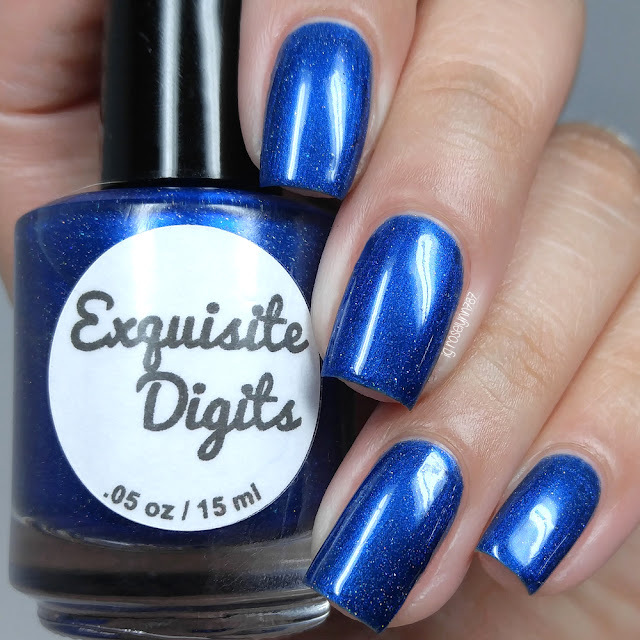 Today I'm sharing The Doctor Collection by Exquisite Digits, a brand recently rebranded from the former Playlist Polish. This is a six-piece collection made up of gorgeous shimmer polishes in various hues. I've been so excited about sharing these with you ever since their initial release earlier this month. So without further ado, let's get to the swatches! The Doctor Collection by Exquisite Digits is now available for purchase. Each full-size 15mL bottle will retail for $6.75. There is also the option to purchase the entire full-size collection for $30.00 or the mini-size (6mL) set for $18.00. 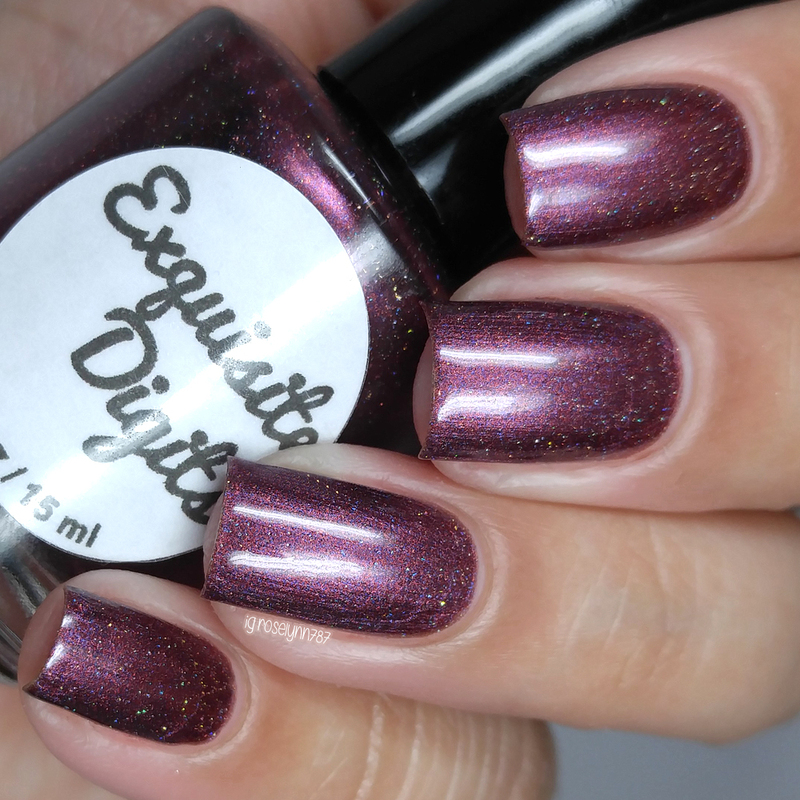 Geronimo can be described as a deep maroon polish with holographic micro flakes. Starting off with one of my favorite shades in this collection! Isn't this so full of vamp?! The tone is so rich and perfect for this time of year. The formula leans on the thin side, but has a nice application for layering. I could have probably got away with two coats on all my nails, but I added a third on most for some more depth. Shown here in two to three coats and sealed with a glossy topcoat. Rose can be described as a rosey brown shimmer polish with some holo silver sparkles. Although it wasn't the intention, doesn't this shade also look great for Fall?! The finish has some minimal visible brush strokes that mostly blend in after topcoat. Shown here in three coats and sealed with a glossy topcoat. Fantastic can be described as a stormy blue gray scattered holo polish. Shown here in two coats and sealed with a glossy topcoat. Gallifrey Sky can be described as a orange, red, and gold color shifting chrome polish. I wasn't expecting to like this one, but the color shift is so gorgeous. It also compliments my skin tone so nicely as well. The formula is consistent with most of the others. A bit sheer at first, but it builds up to opaque finish seamlessly. Again there are visible brush strokes, but they blend in for the most part. Shown here in three coats and sealed with a glossy topcoat. 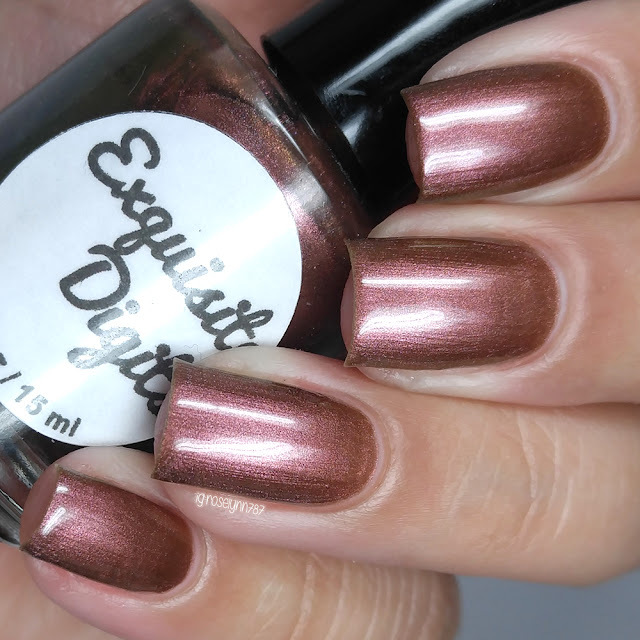 Hello Sweetie can be described as a gold to brown to rose pink chrome shift polish. Shown here in three coats and sealed with a glossy topcoat. 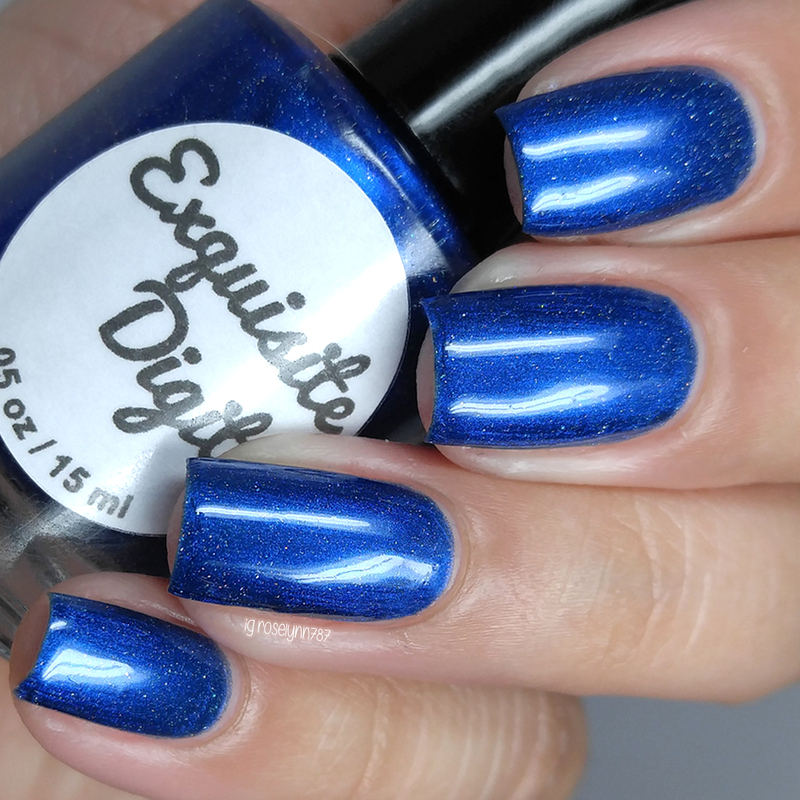 Bigger on The Inside can be described as a bright (Tardis) blue with holo silver sparkle. If it's a blue then you guys know I already am going to love it! The formula was smoother and more opaque than a lot of the other shimmer ones in this collection, I also didn't experience any staining on removal to my nail beds or cuticles, always a big plus in a blue shade. Shown here in two coats and sealed with a glossy topcoat. Overall I have to say I am pleasantly surprised by how much I ended up liking this collection. I'm not a huge fan of shimmer/chrome finishes, but these had such a nice application and finished look. In most cases the slight brush strokes in the finishes gave these polishes a bit more dimension rather than taking away from it. As a happy Whovian, I have to say Bigger on The Inside and Geronimo are major must-haves. My photos really do not do the sparkle in these two any justice! But those are my favorites, which ones are yours? Let me know which ones you'll be getting! To recap, the Doctor Collection by Exquisite Digits is now available for purchase. Each full-size 15mL bottle will retail for $6.75. There is also the option to purchase the entire full-size collection for $30.00 or the mini-size (6mL) set for $18.00. I don't know anything about Dr Who, but I sure know pretty polish when I see it. I'm one to buy anything Doctor Who, but Gallifrey Sky is my favorite. 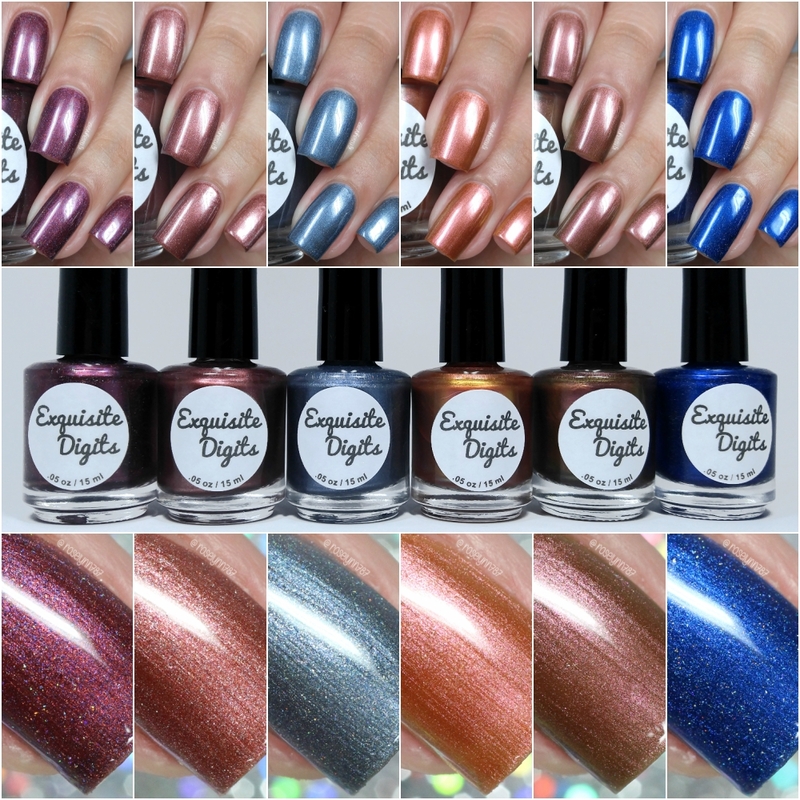 Holy Moly.....these polish, your swatches....a match made in heaven! I've never watched Doctor Who but your swatches are just fantastic! Oh my goodness your swatches are just flawless! I love the metallic finish on these!